Milburn Gomes, who awaited deportation for several months and is now living with his mother in Mumbai, is shown with his son, Ethan. The two speak every day by phone. Milburn Gomes called his sister from the plane to tell her the news. After nearly 17 months awaiting deportation in county jails, he was finally going home to India. Gomes, a 35-year-old restaurant manager, had lived in the United States for more than a decade. 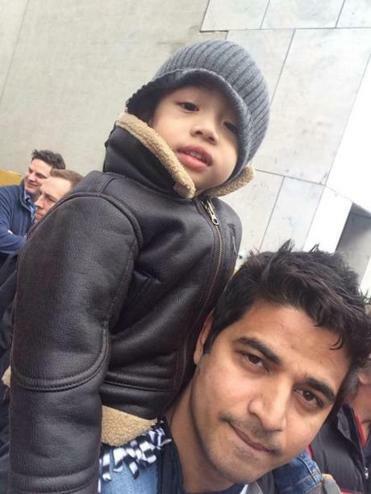 He was leaving his 6-year-old son, an American citizen, behind. But he had grown tired of fighting. Immigration officials had detained him in 2017, after he pleaded guilty to assault in a Connecticut court. Four times US Immigration and Customs Enforcement told Gomes he was going to be deported, but each time paperwork problems delayed his departure. Now, he was on a United Airlines flight out of New York, bound for New Delhi. The plane left the gate, but it stalled on the runway due to mechanical problems. Passengers sat in the plane for more than an hour before the pilot announced the flight had been canceled. The officers accompanying Gomes told him he was going back to jail. As ICE officials intensify efforts to remove unauthorized immigrants such as Gomes, immigration attorneys say the agency is struggling to carry out deportations, sometimes scheduling flights before securing the proper travel documents or final agreements with home countries. As a result, many deportees are languishing in detention for months, often well beyond the legal limit of six months set by the US Supreme Court, according to immigration attorneys. Last December, 92 Somalis who had been deported had to be brought back to the United States after they spent 23 hours shackled in a plane on an airport tarmac in Senegal. ICE cited logistical problems on the ground for its decision. Last month, a federal judge in Michigan ordered the release of about 100 Iraqis who had been held for deportation for about 18 months. The judge blasted ICE, accusing the agency of justifying the immigrants’ detention through false statements that the Iraqi government was cooperating with the American government to take back the Iraqis. The judge’s decision was recently overturned by an appellate court. The number of ICE removals of immigrants arrested within the United States increased 25 percent in the fiscal year that ended Sept. 30, 2017, offsetting a drop in arrests that were made at the border, according to the most recent data available. Federal officials say the delays and logistical wrangling are likely caused by countries unprepared to take back nationals, who are being returned to their native countries in greater numbers than in the past. Todd M. Lyons, acting field office director for Boston’s ICE office, suggested that in Gomes’s case, the Indian government was to blame for the delays. John Mohan, a spokesman for ICE, said the deportation process involves many steps. “Each removal is done on a case-by-case basis, and, as a result, there is no way to predict how much time a specific removal will take,” Mohan said. Requests for comment to the Indian Consulate in New York were not returned. In 2001, the Supreme Court ruled that an immigrant under a deportation order could not be kept in detention for more than six months, unless the government showed a pending removal was imminent. Sarah Sherman-Stokes, associate director of the Immigrants’ Rights and Human Trafficking Clinic at Boston University, said cases such as Gomes’s show a clear abuse of power by ICE, which she said appears to be trying to sidestep the legal limits on detention. Since 2013, the number of civil complaints challenging the detention of immigrants awaiting deportation has steadily increased — to more than 1,500 lawsuits in federal courts in fiscal year 2018. Massachusetts ranked seventh nationally with 87 lawsuits. Gomes was living in Connecticut in June 2016 when a former girlfriend accused him of assaulting her and violating a restraining order. Gomes, who had no other criminal record, denied hitting her but acknowledged he violated the restraining order by texting her to find out why she had accused him of abuse. He said he pleaded guilty on the advice of his lawyer to avoid jail time. He was sentenced to five years of probation. ICE officers picked him up on his second visit to his probation officer in Stamford, Conn. In fiscal 2018, 90 percent of 158,581 arrests made by ICE involved immigrants who had a criminal conviction, faced a criminal charge, were a fugitive, or had a reinstated final order of removal, Mohan said. “These statistics show that ICE continues to focus its enforcement efforts on aliens who pose a threat to public safety,” Mohan said. Gomes had overstayed a five-year visa in 2012, when he learned his girlfriend at the time was pregnant. They broke up but remained friends. Gomes moved close to his son, Ethan, so he could pick him up every afternoon from day care. The assault charges involved a new girlfriend. In March 2017, he was sent to the Bristol County House of Correction in Massachusetts, which is run by Sheriff Thomas Hodgson, known for his hard-line views on immigration. There, Gomes developed a blister on his mouth that swelled to the size of a grape, then festered, resulting in pain so excruciating he couldn’t eat or sleep. He said medical officials ignored his repeated requests for treatment. He was finally taken to a hospital when he tore the blister off one night and passed out at the sight of blood all over his cell floor. A spokesman for the jail said he received proper care. Gomes did not want Ethan to see him in jail. His mother took him to visit once, but jail officials told her the boy could not come inside because he did not have a notarized form. When his mother broke the news, Ethan wept. “Why won’t they let me see my daddy?” he asked his mother, according to an affidavit she filed in court. Gomes was eventually transferred to Suffolk County jail in Boston, where he said conditions were considerably better: The guards would share their food with the detainees and bring them new movies to watch in the common room. But the indefinite nature of his detention began to wear on him. Gomes went on a hunger strike to protest his incarceration, and in June, seven months after he received a final deportation order, his lawyer filed a federal complaint demanding his release so he could spend some time with his son before being sent back to India. ICE repeatedly insisted deportation was imminent. When the deportation plans fell through, officials cited expired travel documents, or a lack of visas for the agents scheduled to travel with Gomes. After the aborted flight in August, Gomes begged ICE agents to let him sleep at the airport and wait for the next flight. They refused. Mohan said there are logistical reasons why ICE may not just simply board the next flight but said he could not detail them publicly. Eventually, Gomes became so desperate he told his family to give his passport to the Indian consulate so they could process his departure. On Oct. 11, Boston federal court Judge Denise Casper called on ICE to provide evidence for why Gomes should not be released. Four days later, Gomes was finally deported. He is now living with his mother in Mumbai. It was only after Gomes had left the United States that he was able to see Ethan again — via video chats on his phone. They speak every day. “I want to hug him and kiss him,” Gomes said during a recent telephone interview. He began crying.